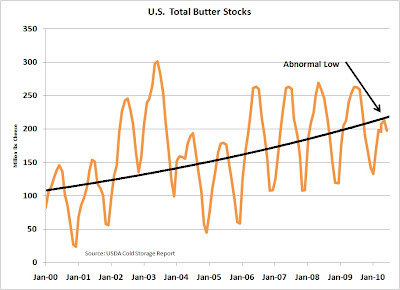 What has happened to Cheese and Butter Inventories? 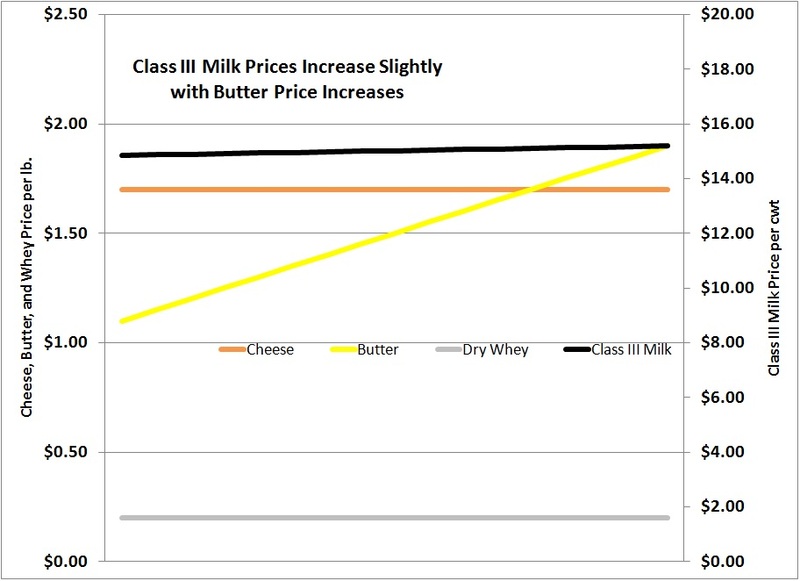 Currently, we have an unusual pricing scenario in dairy with very high butterfat prices and relatively low protein prices. Prices are of course driven by supply and demand and the resulting inventory levels. 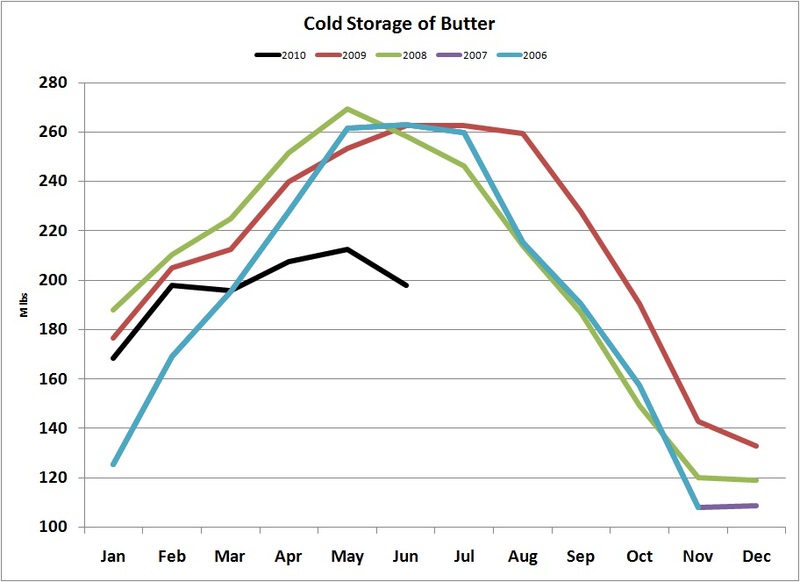 The first two graphs in this post deal with cheese and butter inventories. Cheese inventories did not reach their normal seasonal low at the end of 2009. We are now in midyear and the midyear peak appears to be a little high, but not hugely out of line with the growing cheese markets. 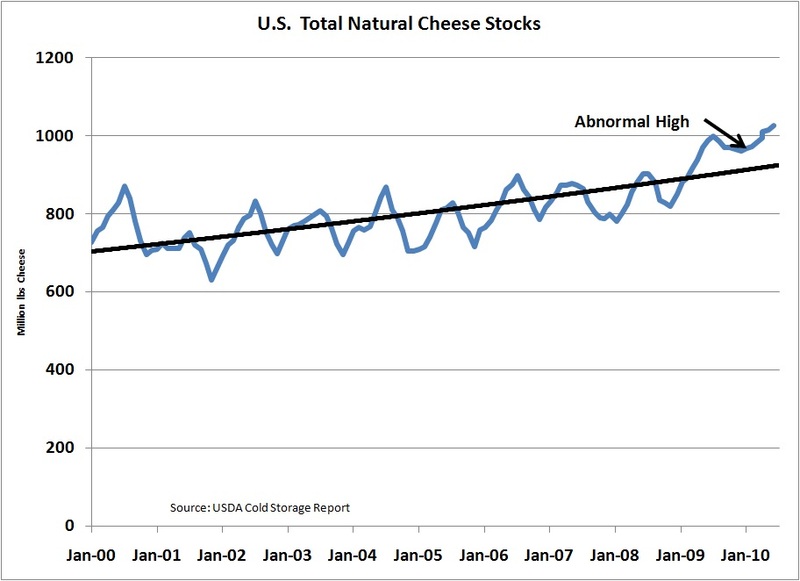 The annual cycles for American cheese can be viewed on the USDA site. 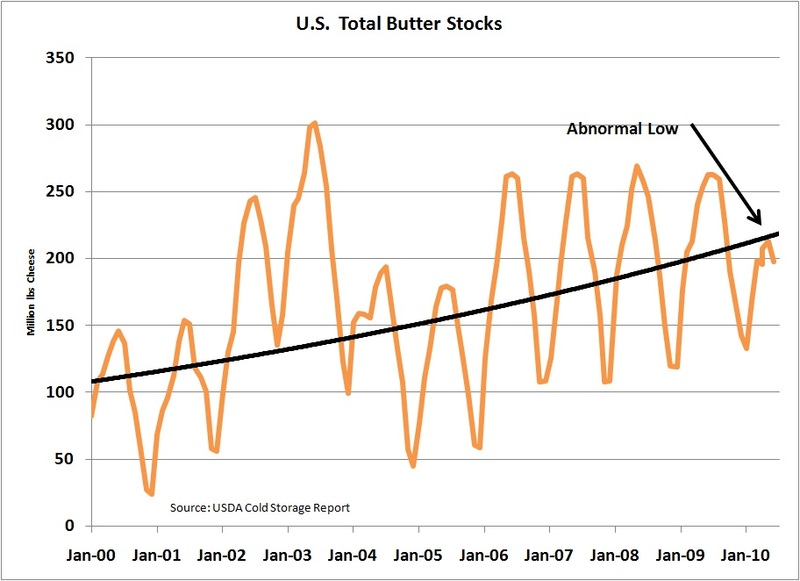 Butter inventories have been extremely low, with a peak about 50 million pounds below normal levels. 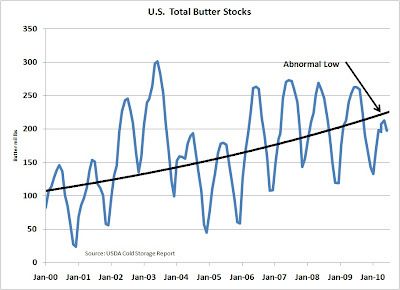 A similar situation happened in 2004/5 and butterfat reached over $2.50/lb. The yearly cycles can be viewed on the USDA site. To better understand what is behind the inventories; below are analyses of imports, exports, net exports (exports minus imports) and production. Cheese statistics will be viewed first and butter statistics second. 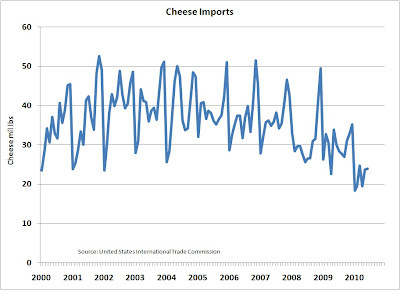 Cheese imports are down to the lowest levels in the last 10 years. This should help reduce cheese inventories. 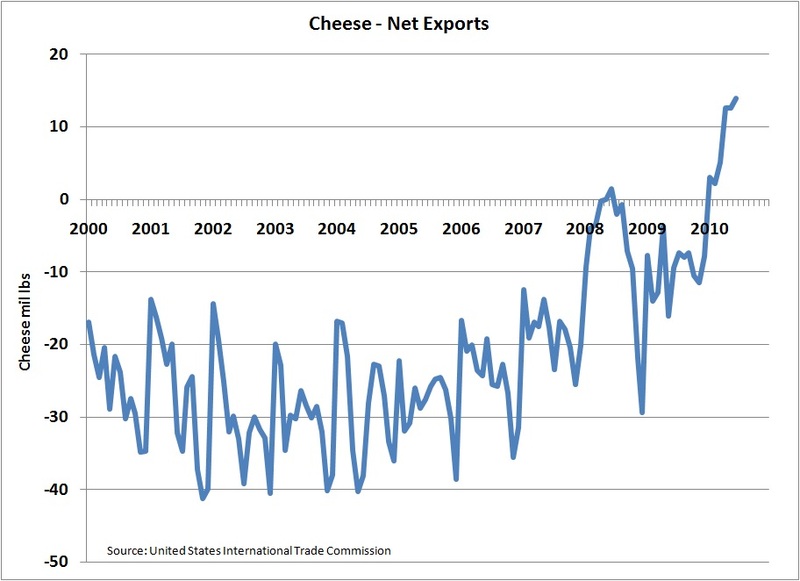 Cheese exports are up significantly, more than tripling the levels of 5 years ago. This should help reduce cheese inventories. When exports and imports are combined, one can see that the U.S. has gone from being a net importer to being a net exporter. This should help reduce cheese inventories. 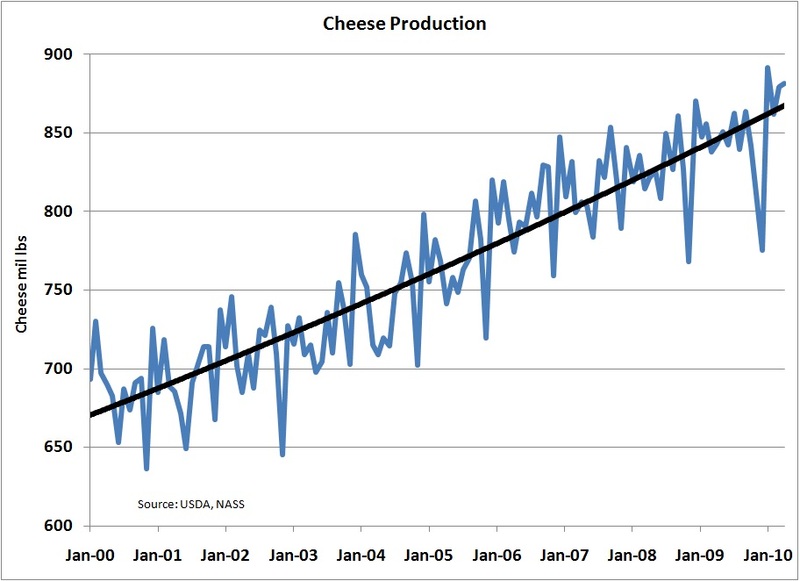 Cheese production has remained robust. The annual cycles can be viewed on the USDA site. June cheese production set new high records for this month of the year. 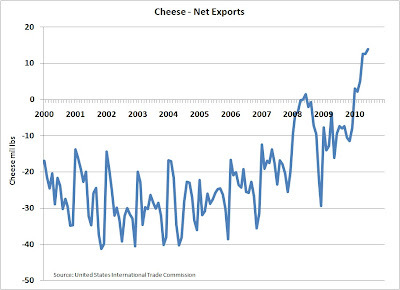 Cheese net exports are healthy, up around 20 million pounds per month. 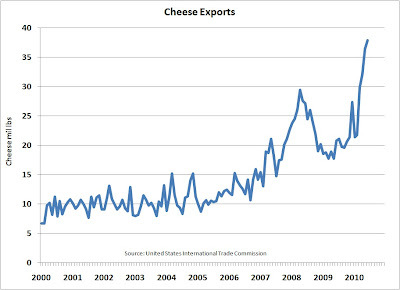 However, cheese production has risen between 20 and 40 million pounds per month. U.S. consumption data is not yet available, but historically it has shown steady and predictable growth over many years. 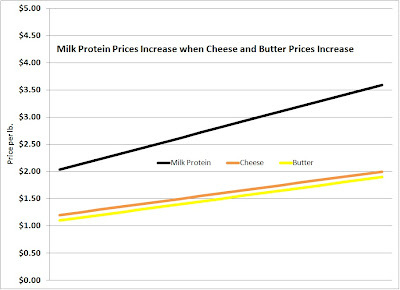 In late 2008 and early 2009, with high milk prices, retail cheese increased enough that demand was suppressed. With lower milk prices, the growth in cheese consumption should be continuing. 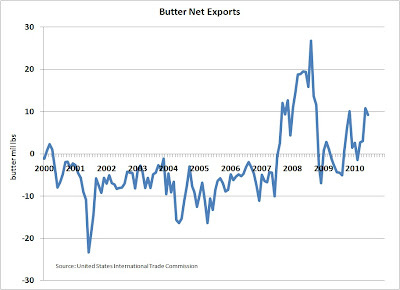 ...and more butter is being exported, although exports have not reached the heights seen in 2008. 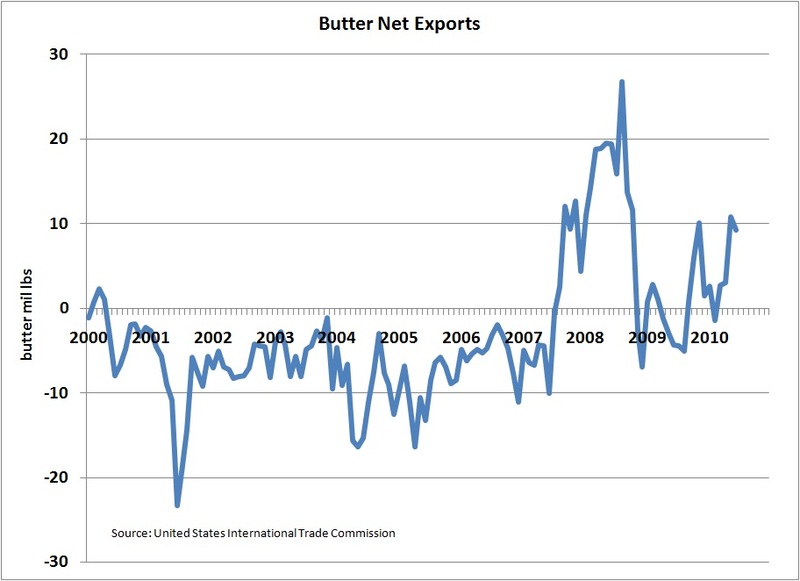 Net butter exports (export minus imports) have reached the point of making the U.S. an exporter of butter. But while net exports have risen by nearly 10 million tons in 2010, production has not matched this demand. 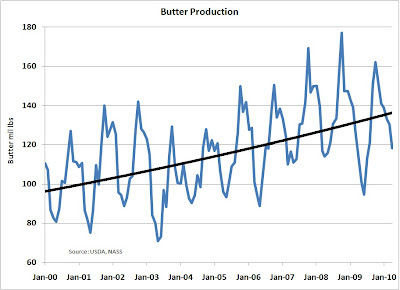 In fact, butter is down approximately 10 million tons. The annual cycles can be viewed at the USDA site. Consumption of butter has been very steady for many years, so no change in consumption is expected. In summary, the changes in inventories can primarily be linked to production which is out of sync with demand. This will no doubt reverse itself, but for now has created an unusual supply and demand situation that will take months to correct. 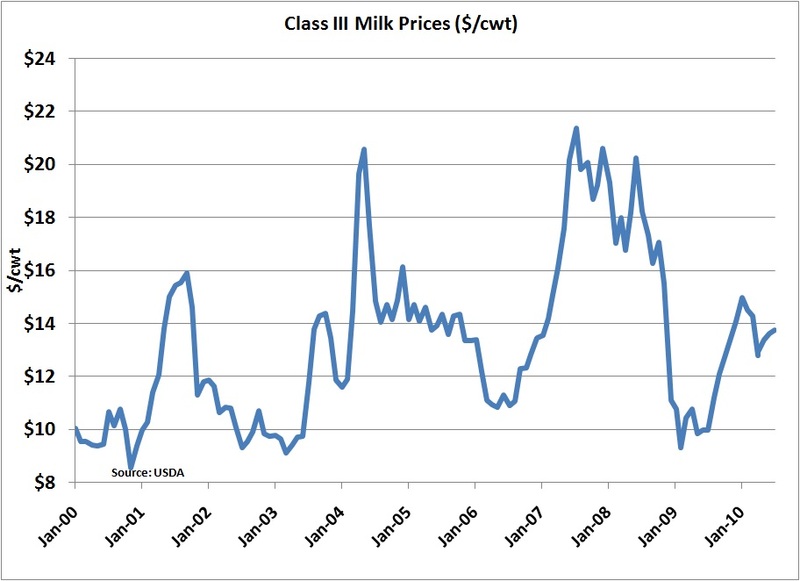 We are in an unusual period in milk component pricing. 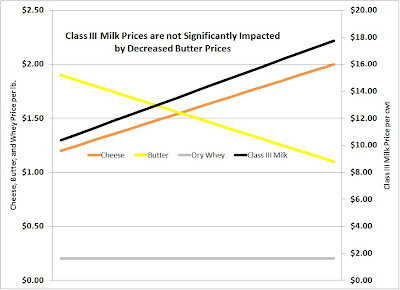 Butterfat's value is increasing significantly and the price of milk protein is dropping significantly, yet the Class III milk price has barely moved (see last week's post). This post will examine the math behind this scenario. The formulas for milk pricing are available on the USDA web site. We'll examine the simple formulas first. This formula is very straightforward. 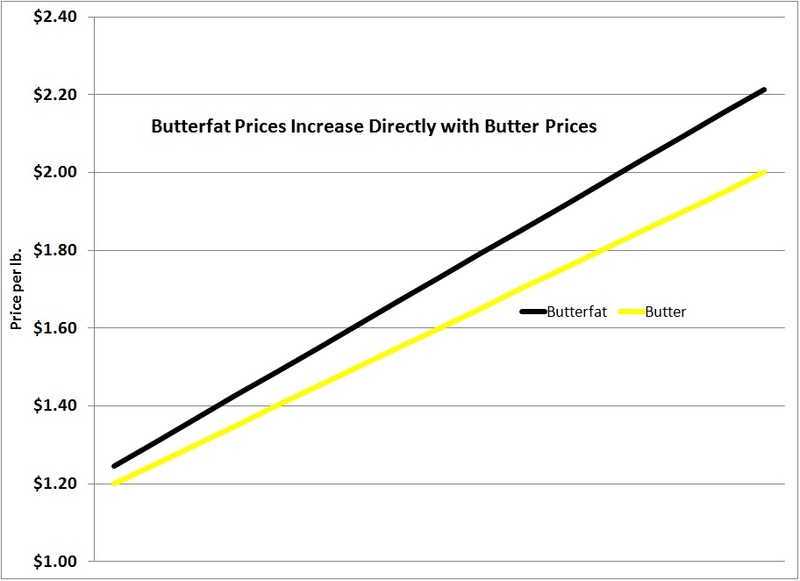 The butter price is reduced by the cost to make butter (the "make allowance") and then multiplied by the ratio of how much butter can be made from a given quantity of butterfat. 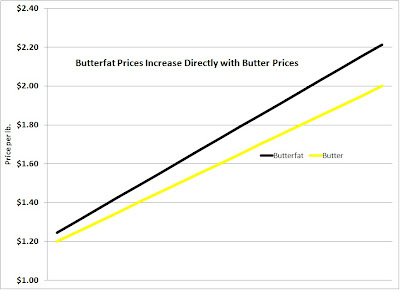 The relationship is very direct, as the price of butter goes up, the price of butterfat goes up. The pricing of "other solids" is similarly straightforward. 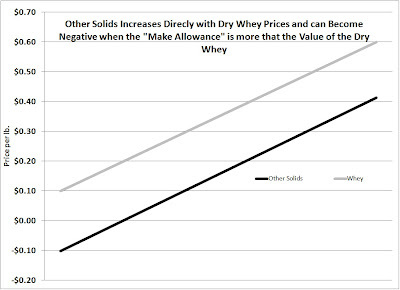 It is based on the dry whey price less the cost to make dry whey multiplied by the amount of dry whey that can be made from "other solids". 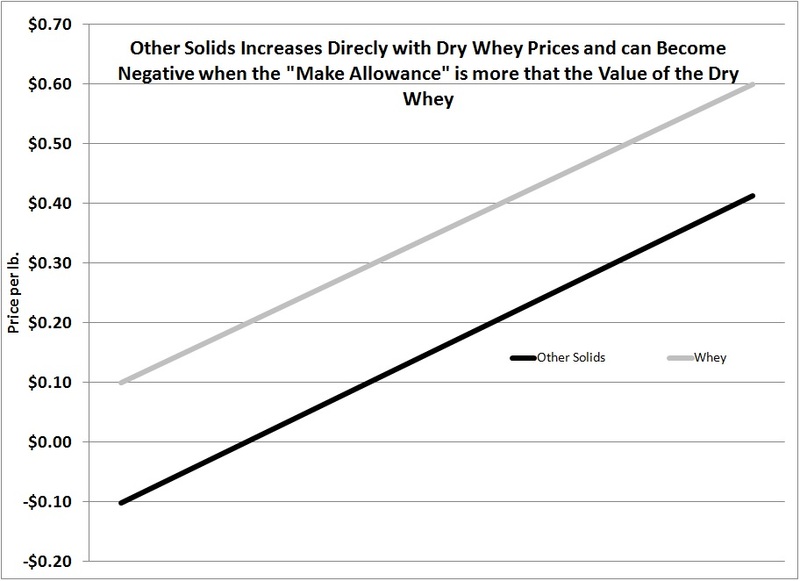 The only uniqueness to "other solids" is that because whey is very inexpensive, the cost to dry and prepare dry whey can be greater than its market value and when this happens the value of "other solids" become negative. The first line of the protein price follows the logic of the "butterfat" and "other solids" formulas. However, the second part shown on the second line above gets more complex both conceptually and mathematically. The second half of the formula gives a value to the increased value of butterfat when it is used in cheese as opposed to butter. This is the part of the formula that can shift the value between butterfat and milk protein without much impact on the overall Class III price. This relationship will be illustrated in the following graphs. 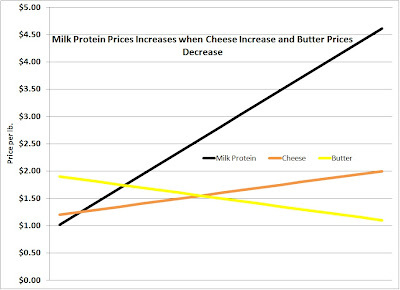 When the price of butter is constant and the cheese price increases, then the protein price will increase. 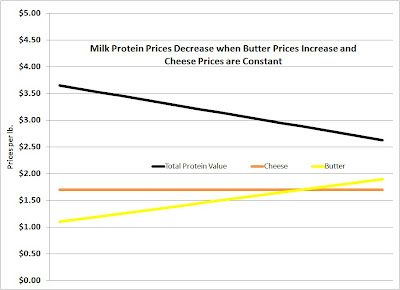 However when price of cheese is constant and butter increases in value, the price of protein decreases. 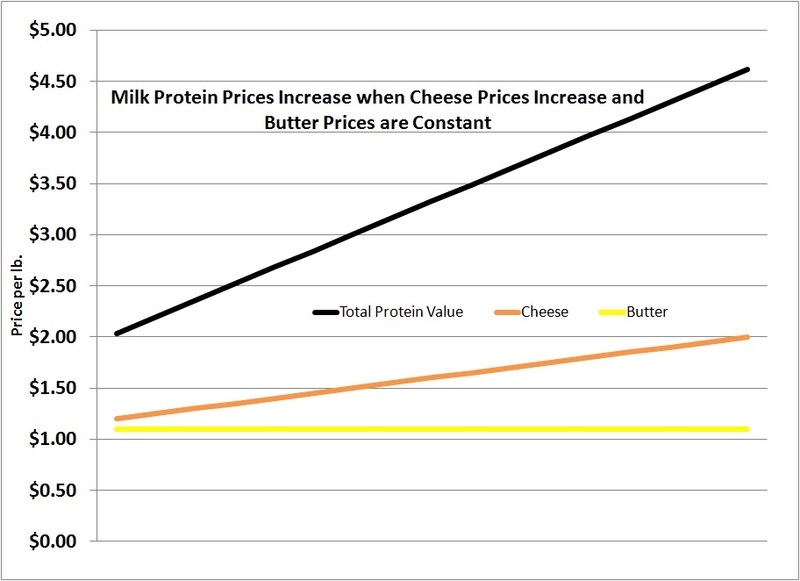 When Cheese goes up within its normal variation and butter decreases in it's normal variation, the price of protein will reach peak values. 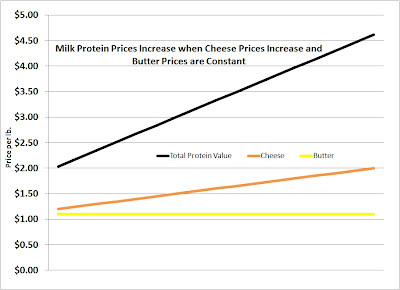 When cheese and butter both increase within their normal variations, protein will increase in value, but not as reach high a price as when butter is low. The Class III prices are really only impacted by cheese prices. We have examined this in previous posts to this blog. Graphically, this can be visualized as follows. 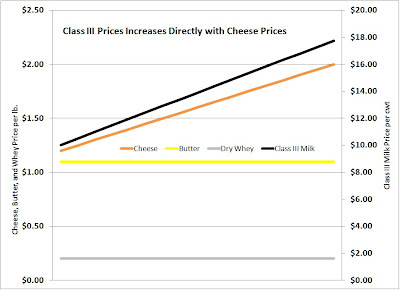 When cheese prices increase significantly, Class III prices increase significantly. However, when butter prices increase significantly, the class III price barely changes. 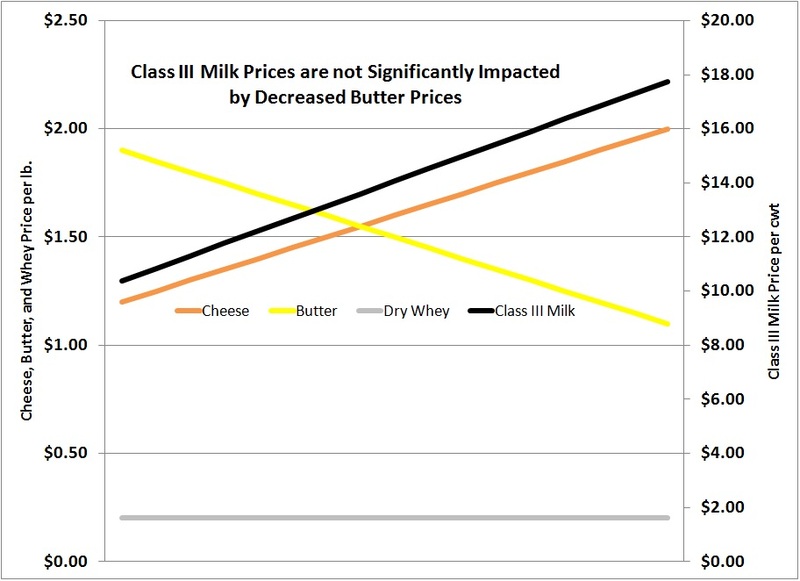 When cheese is increasing and butter is decreasing, the Class III price largely ignores the change in butter prices. 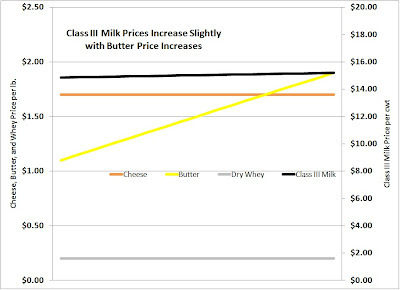 When butter and cheese both increase to their historic highs, the Class III price will reach its highest, but that high is close to the high when just cheese prices are high. 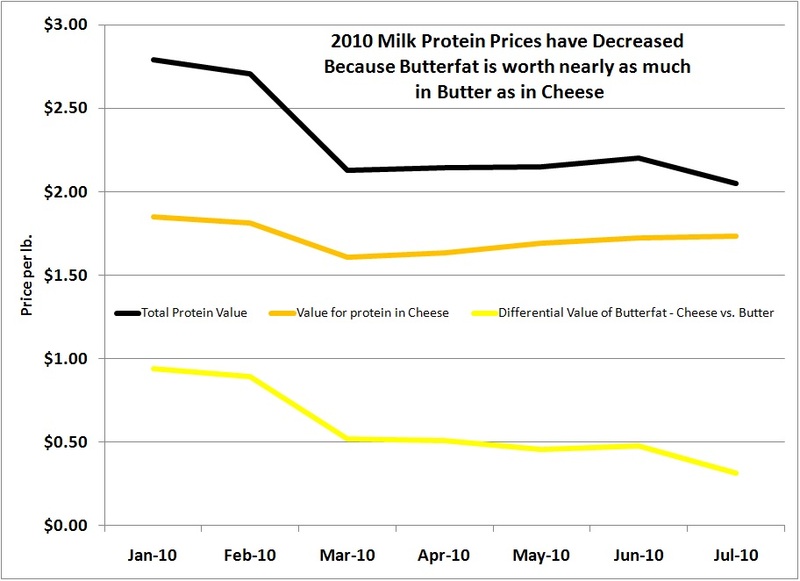 In 2010, we have experienced a period where butter prices are significantly up and cheese prices are significantly down. 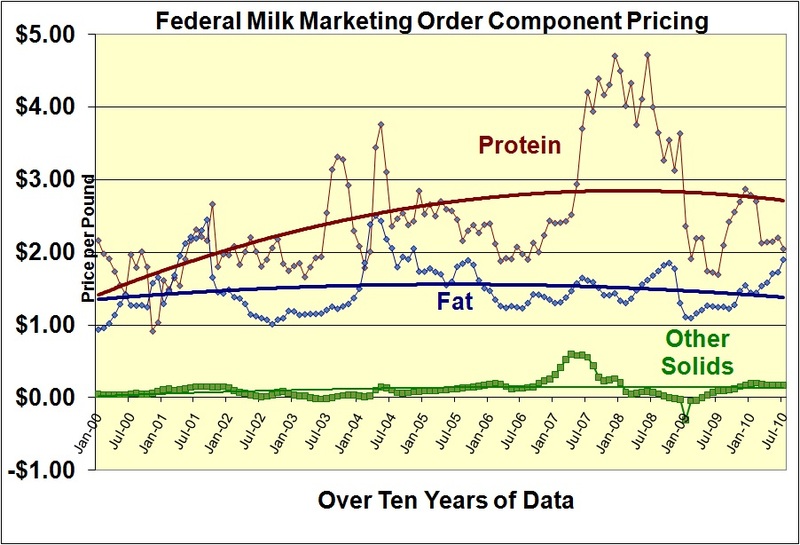 This has created a big shift in the relative values of butterfat and milk protein. 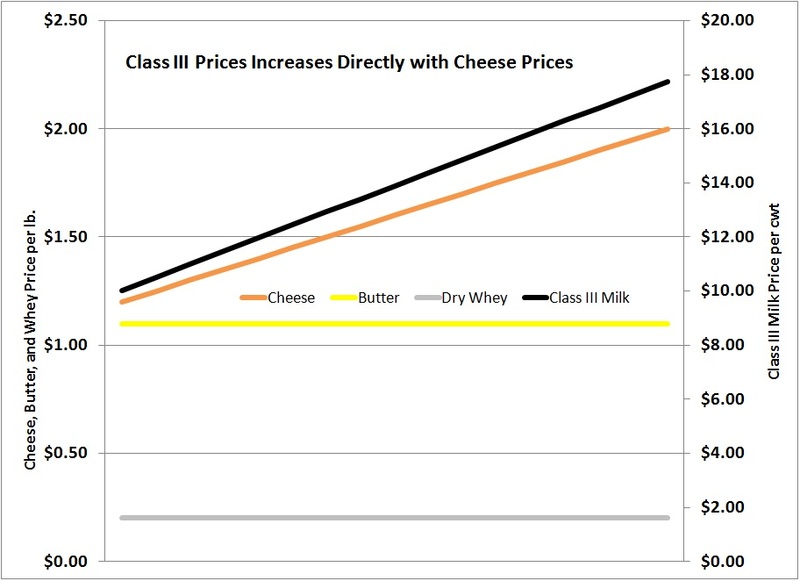 The Class III price has followed only the cheese price. The chart below shows the two parts of the protein formula separately. 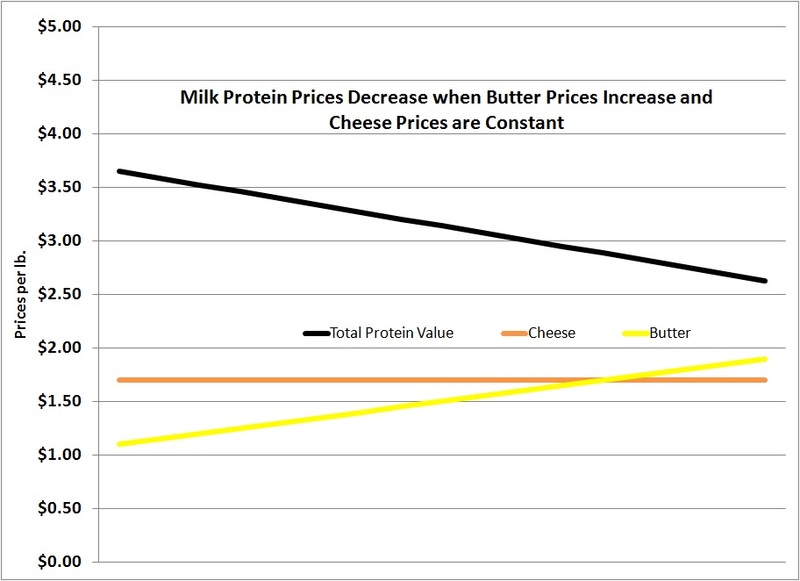 While the price of cheese has had only slight variation, the value differential for butterfat in cheese vs. butter has reduced the protein price by nearly $.60. 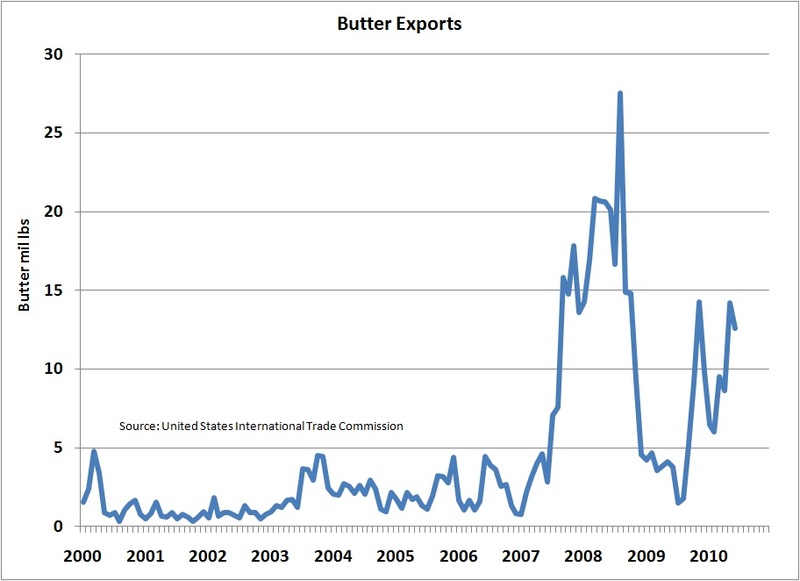 The inventories of butter remain very tight. 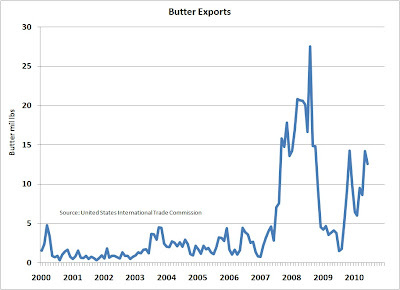 Therefore, we can probably expect butterfat to command very high prices for the foreseeable future. 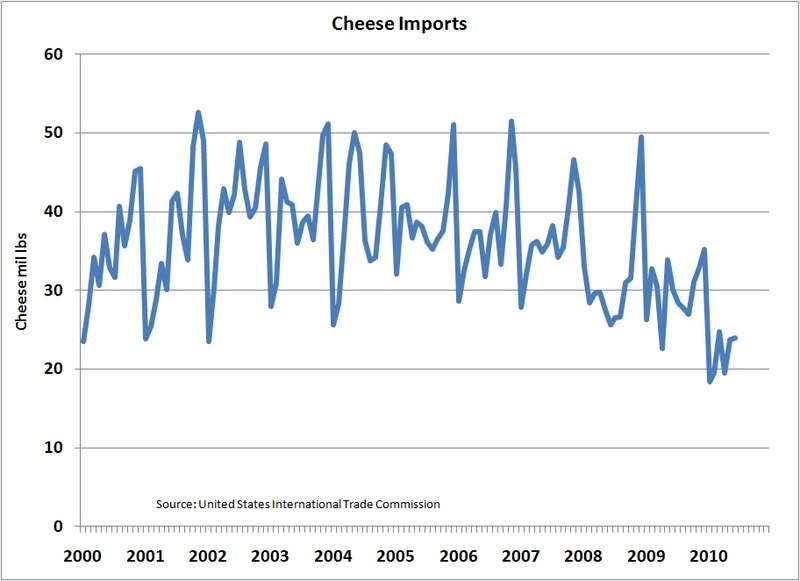 The inventories of cheese however are coming more in line with historical levels and we can probably see an increase in Class III prices and the value of protein as this occurs. 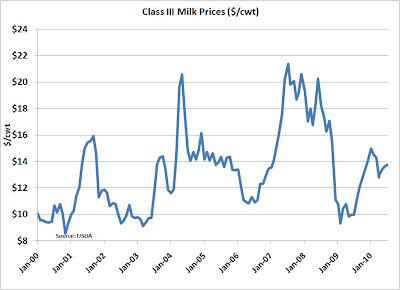 Class III milk prices were up slightly for July, as cheese prices continue to improve. (Please see the April 7, 2009 post to this blog for a review of the close relationship between cheese prices and Class III milk prices.) July's Class III price was $13.74, up from $13.62 in June. 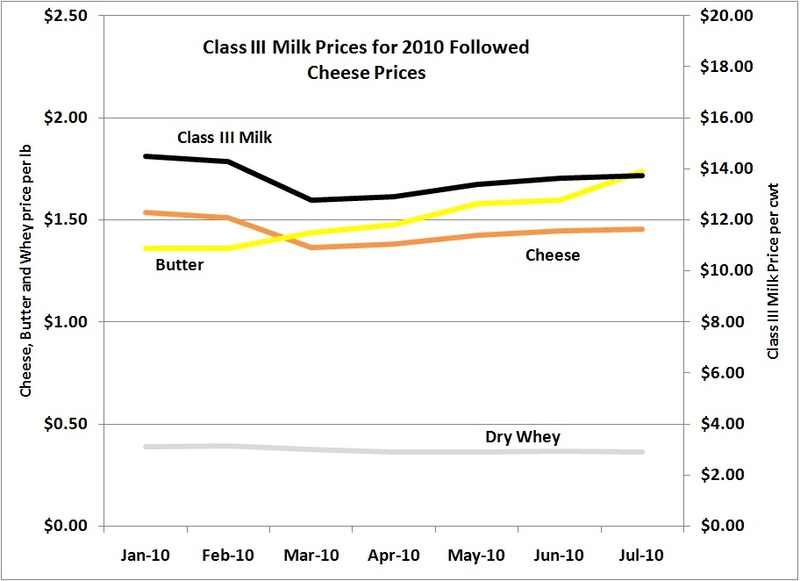 Looking forward, cheese prices appear to be improving which will continue to improve the Class III milk price. 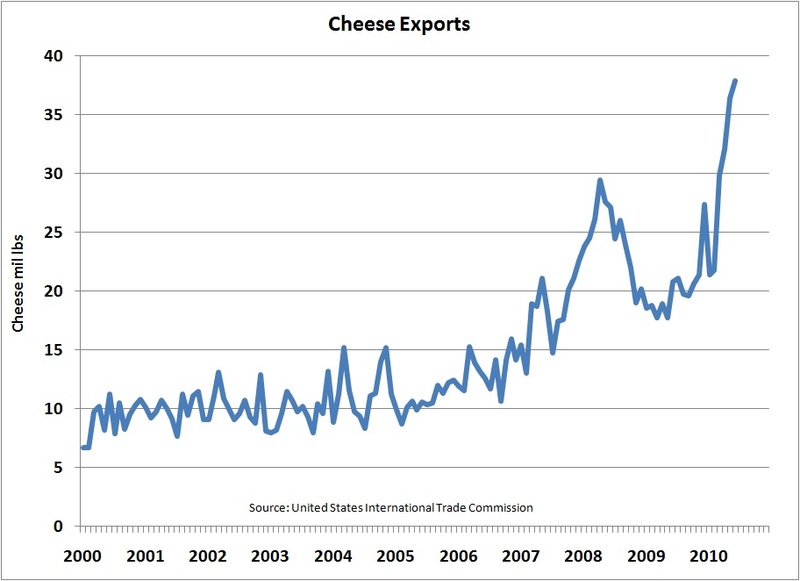 The encouraging part about cheese prices is that the underlying data indicates that the cheese inventories are shrinking which will allow cheese prices to continue their recovery. 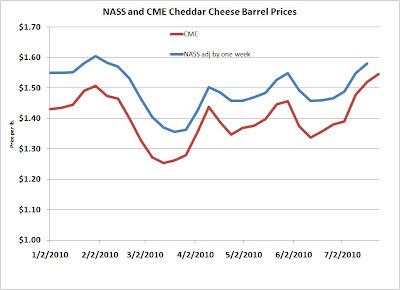 The NASS cheese prices on which milk component prices are based are published one to two weeks behind the CME prices. 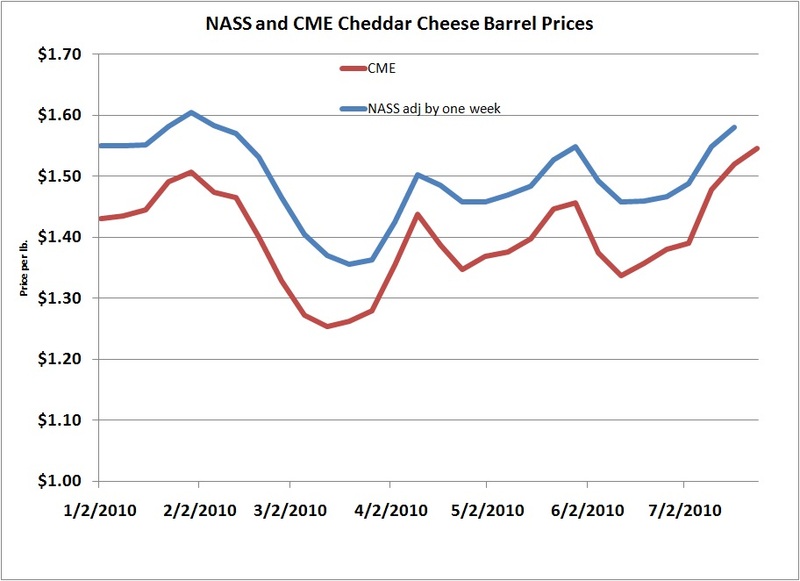 The latest CME prices indicate that the NASS prices will continue to improve. 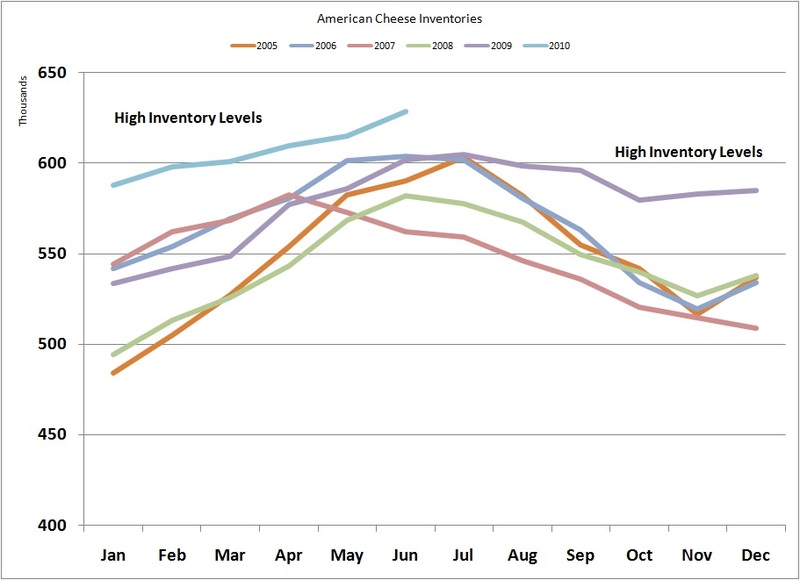 Cheese inventories have been abnormally high keeping cheese prices low, but the high inventories are now coming down to more normal levels. 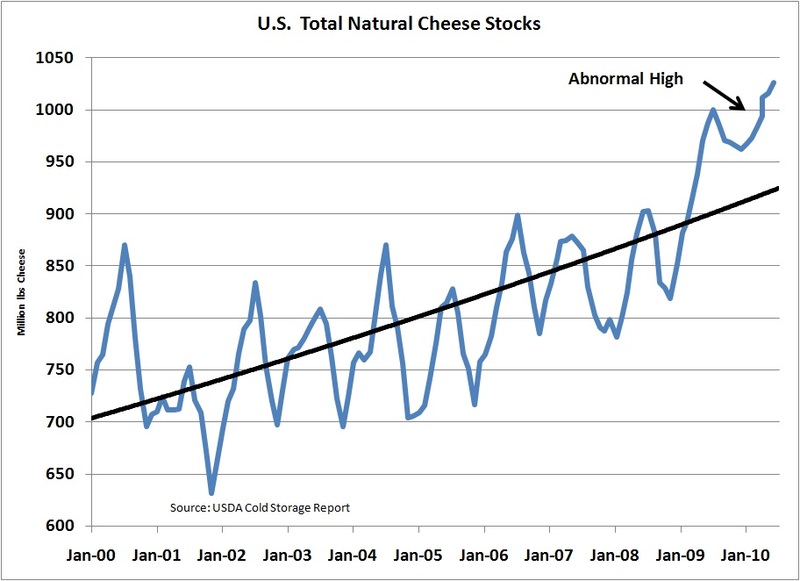 The chart below shows the high levels of current cheese inventories. 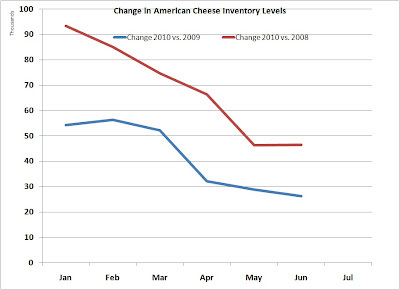 As these high inventory levels decline, cheese prices can be expected to improve. 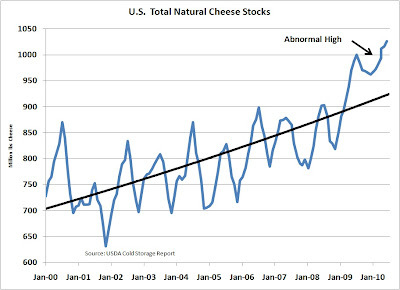 When compared to the 2008 and 2009 period, 2010 cheese inventories are showing a return to more normal levels. 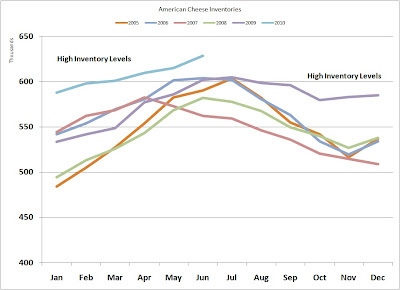 The chart below shows the change in 2010 inventories vs. 2009 and 2008 levels. The difference between the current year and the prior years is down nearly 50%. 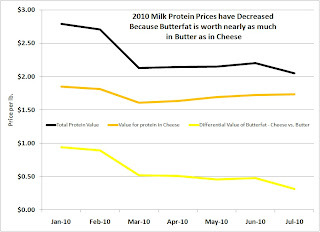 The unusual part of the July announcement was the interplay between the protein price and the butterfat price. 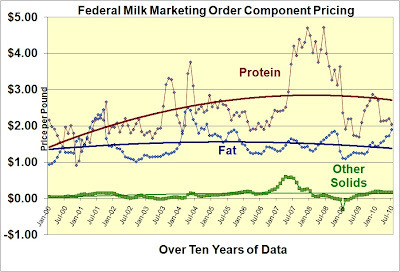 The butterfat price was extremely high which drove down the protein price significantly. A full explanation of this relationship will be given in the next post to this blog. 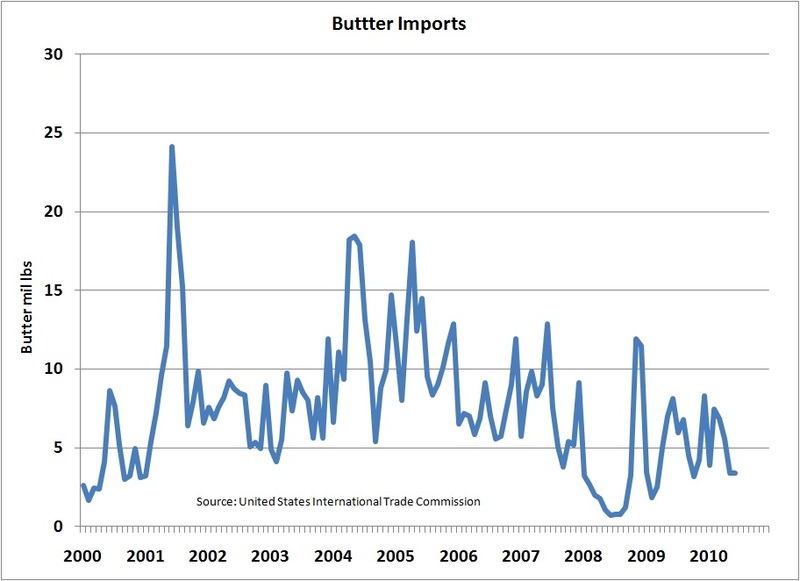 Butterfat increased from $1.72/lb. in June to $1.90/ lb. 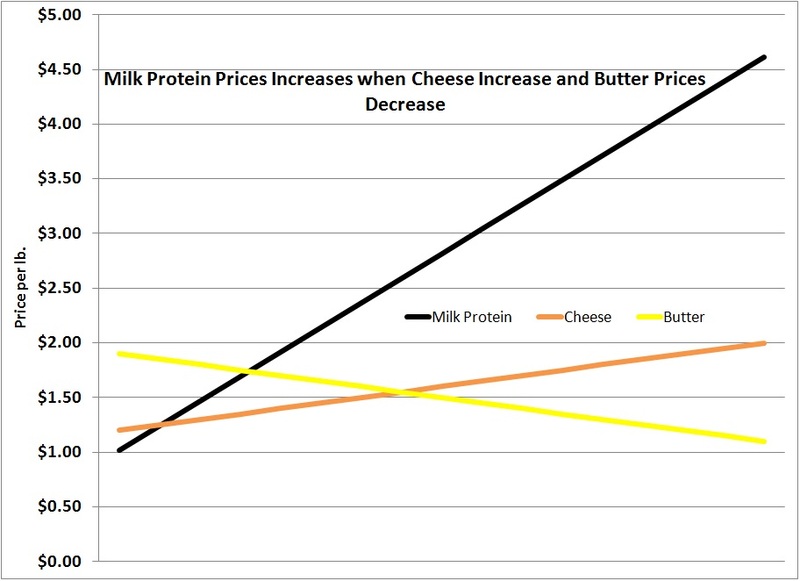 This increase in the butterfat price drove the protein price down from $2.20/lb. to $2.05/lb. 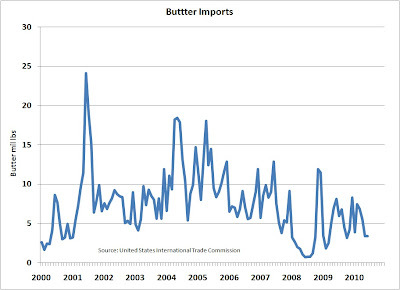 The price of butterfat is very high due to the extremely low inventories. 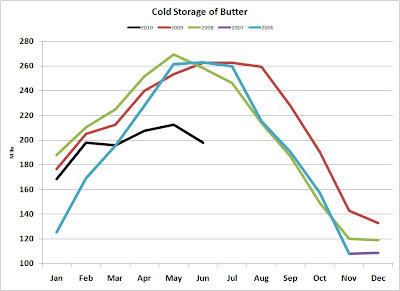 The cylical inventory levels for butter are far below where they normally are at this time of the year. This is driving butter prices extremely high. 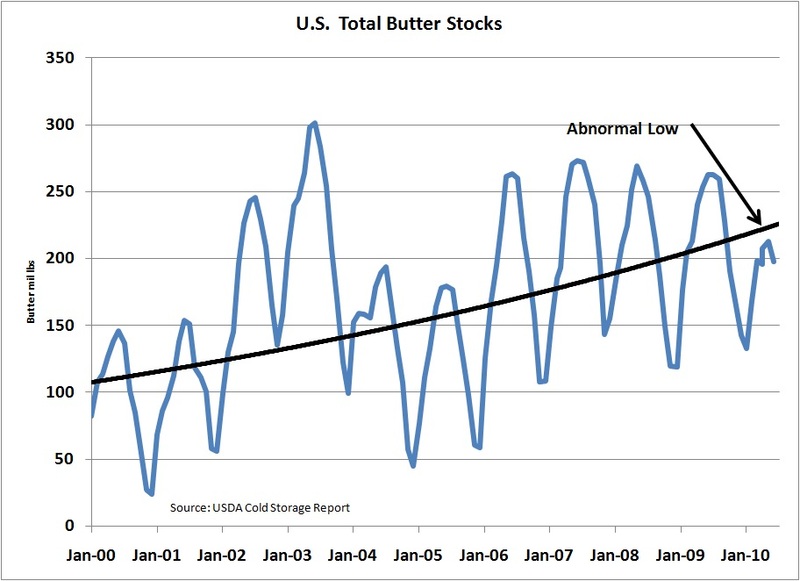 A similar situation developed in 2004 sending butterfat prices to $2.50/lb. Overall the dairy markets are improving. 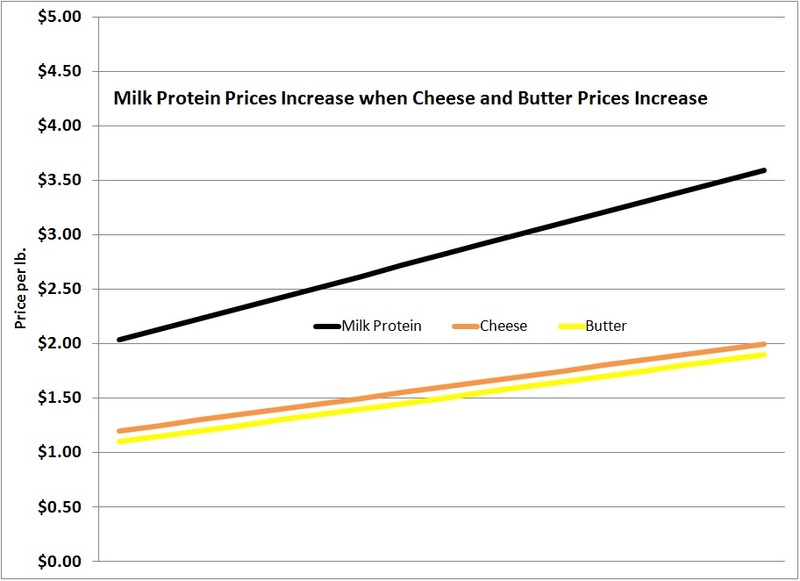 The financial health of the dairy industry is very dependent on the price of cheese. The oversupply in cheese inventories is decreasing and this will increase the price of cheese and thereby the price of Class III milk. However, it will probably take the remainder of 2010 for this to play out.